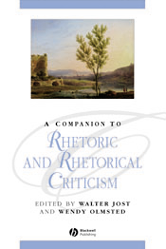 A Companion to Rhetoric offers the first major survey in two decades of the field of rhetorical studies and of the practice of rhetorical theory and criticism across a range of disciplines. Assesses rhetoric's place in the larger intellectual universe. Focuses on the practical side of rhetoric, looking at specific works, problems and figures. Provides examples of rhetoric from ancient times to the present day. Written by leading scholars from a variety of different fields.